It's August ALREADY!!!! It's that time of the summer when I'm so used to warm, sunny days that I expect them and sometimes take them for granted by not going out about to enjoy it. It's also the time of the summer when I begin to panic that all my soaking the seeds in February/March, carefully planting them in little pots with my own rigged up "greenhouse"atmosphere for them, making sure they get time under the little grow light I have and hovering over them like a mother with a newborn will come to nothing. I experience a touch of anxiety the first time I put them outside around the second week of April, putting them out for an hour the first time and checking them frequently for signs of stress. As I build up time for them to be outdoors I to learn to be separated from them with less angst. Once they're on their own I make sure that they're secure and staked up, safe from windy storms and I learn to adjust their watering requirements. I'm learning who they are and what they need. They grow, they branch out and then one day I spot the beginning of a flower. 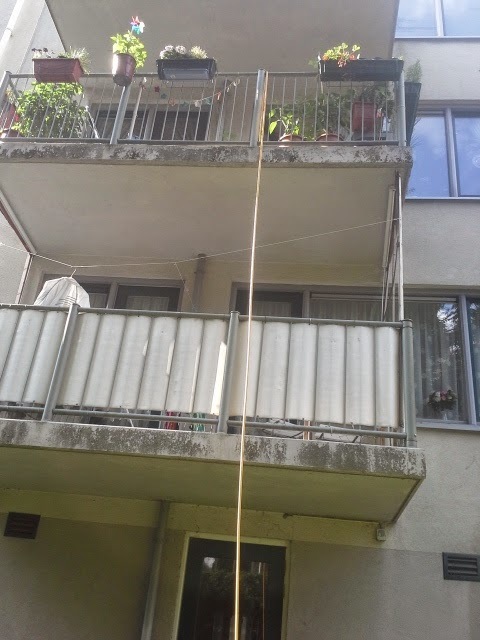 I feel the excitement and anticipation of a grandparent-to be and try to make the best environment to help my "baby" give birth to her baby, giving her fertiliser and more water, giving her a spritz of homemade pest repelling spray. I love to sit out in the late afternoon sun and just look at all my babies growing their babies. But then August happens I start to panic. The pregnancy (flowering) is going on for far too long and I being to panic. Will I have sunflower, strawberries, tomatoes, peppers,nasturtium? Has something gone wrong at this late stage? And then virtually overnight this happens! This sunflower had to be re-homed to the garden on Sunday just as the larger one had to be the week before. This time there was no neighbour home to help so I thought about it for a while and decided that going backwards down the stairs (very carefully) might get the whole thing down intact and I was right. This was my reward for my great moving job. 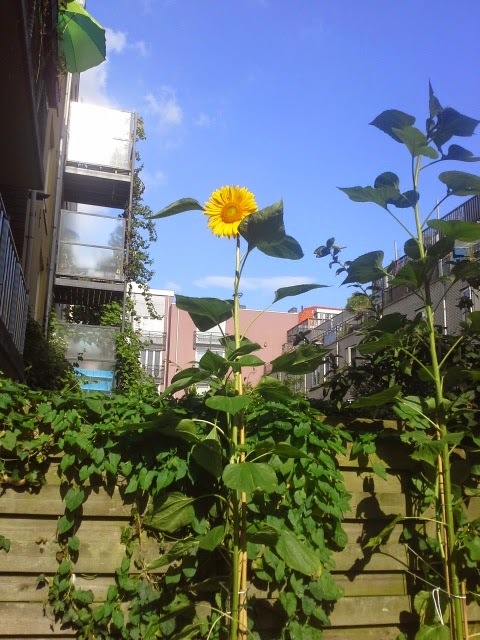 The larger one continues to grow but the flower has not come out yet although I can see it from my balcony getting more and more ready to burst forth . It's well over 8 ft. now! 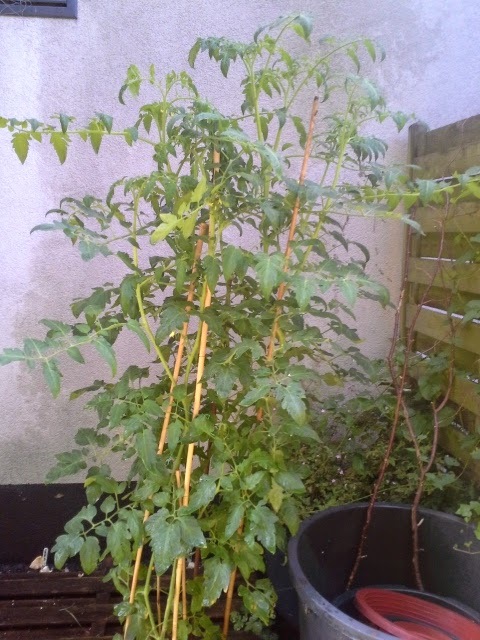 The this tomato plant in the garden is growing taller and taller. Little flowers have begun to pop out but I think it's going to be a late bloomer. Luckily tomato plants can continue growing into October here so there's hope for these Beefsteaks yet. 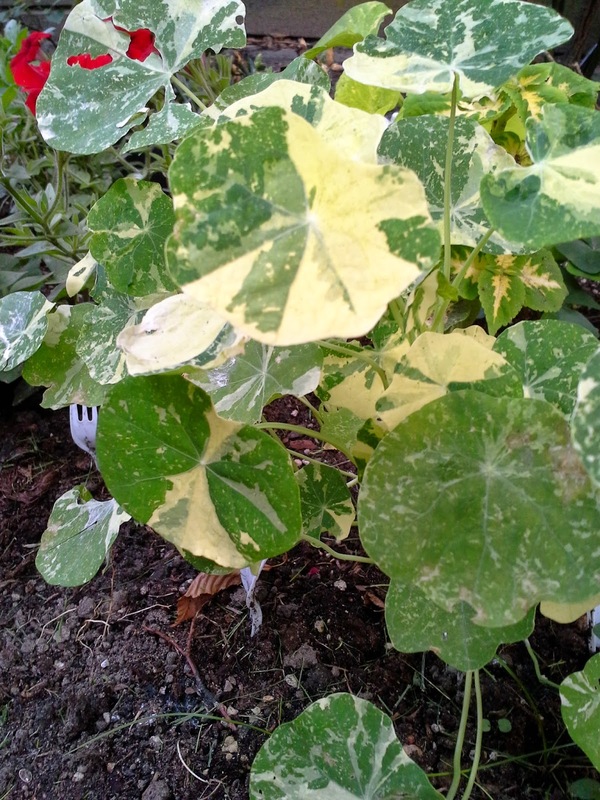 The nasturtiums planted in the little flower bed I made are doing better than the ones on the balcony and the ones I tried to grow in the house. They can also be late bloomers. The ones I had on the balcony flowered twice through the winter. That little flash of orange flowers was a cheering sight on the cold, drab, dismal days of December, January and February. All this outside growing demands lots of water. It's been a struggle carrying a 20 liter and 10 liter container numerous times down two flights of stairs. OH has been a big help with these but it's been a struggle filling the supply with the demand. 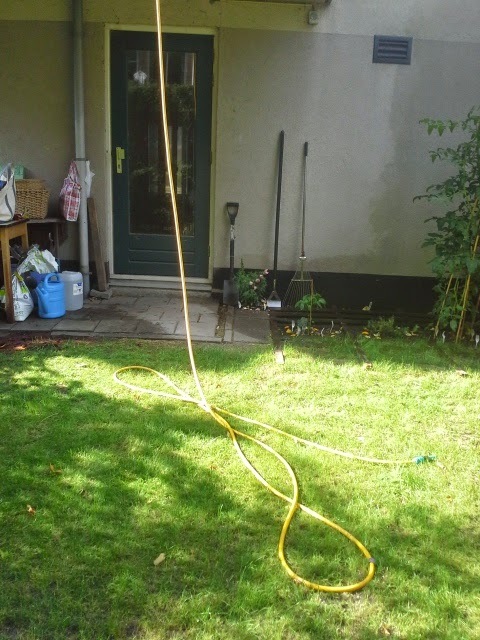 Yesterday I put the pressure on for him to finally dig my hose that I brought with me from Ireland out from the depths of our storage room. He can be a very lazy so and so at times but I presented a great case for reducing the need for water trips up and down the stairs. That's it all rigged up from the sink in the shower room. There's just enough room to store it on it's reel in there when not in use so that worked out well. I'm still a bit afraid to leave the faucet unattended since I had a bad experience in my kitchen in Ireland that resulted in a flooded kitchen floor. (I ended up getting an outside tap put in.) So for the time being it'll be a two person job: one to do the watering downstairs and the other to turn on/off the water and keep a close eye on any leaks. I'll try fine tuning the connections. to keep a better seal from tap to hose but right now I'm a happy camper. I wish you happiness in your gardens, too.